Spaghetti aglio e olio is a traditional pasta dish from the villages of Naples, Italy, a dish cooked with very, very few ingredients. Here, spaghetti is cooked with garlic and salt, in olive oil, each one of these ingredients more or less always available in the Italian countryside. Apparently, the villagers would cook this dish when the times were hard, when there would be nothing much to cook with but when one still wanted to eat a hearty meal. Though traditionally spaghetti aglio e olio would be cooked with just these four ingredients, sometimes other things would be added in too, as and when available, to enhance the flavour of the dish. Sometimes a twist of dried herbs or some chilli flakes would go in, sometimes a rind of Pecorino or Parmesan cheese. Modern-day restaurant versions of this dish include ingredients like olives, sun-dried tomatoes and parsley. The dish has, indeed, travelled a long way – from the war- and poverty-stricken villages of Italy to the posh restaurants of India. The husband and I love spaghetti aglio e olio, and I make it often for dinner, whenever we are in the mood for some Italian. 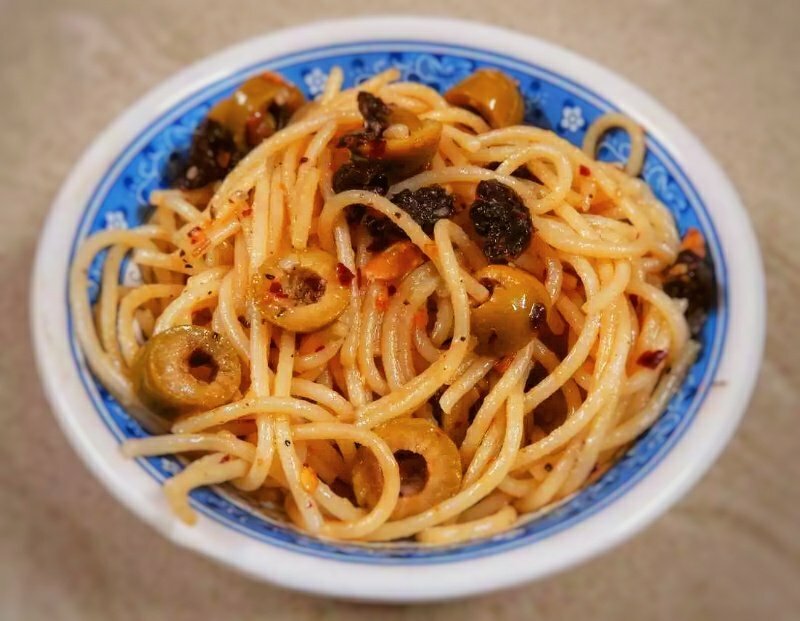 I usually make it with some olives, sun-dried tomatoes, chilli flakes and dried herbs, which makes it aglio olio e peperoncino, as the Internet tells me. Spaghetti aglio olio e peperoncino – or burnt garlic spaghetti, if I may call it that – isn’t a tough thing to make. If you have but a few ingredients in your pantry, you can make it, in a matter of minutes. Let’s check out the recipe, shall we? Place the spaghetti in a wide pan, and add just enough water to cover it. Add in a bit of salt and a teaspoon of olive oil. Cook on high flame till the water boils, and then lower flame to medium. Cook till the pasta is done, but not overly mushy. Immediately, transfer the cooked spaghetti to a colander. Run cold water over it. Place aside, and let all the water drain out. Meanwhile, peel the garlic cloves and chop them very finely. Take the 2 tablespoons of olive oil in a heavy-bottomed pan. Add in the chopped garlic and place on medium flame. Stirring intermittently, saute till the garlic turns brown, taking care not to burn it too much. Add in the washed and drained spaghetti, salt to taste, chilli flakes, olives, chopped sun-dried tomatoes and oregano. Mix well. Gently stirring on an intermittent basis, let the spaghetti warm up in the pan. Ensure that it doesn’t get burnt. When it is warm enough, transfer the spaghetti to serving plates and serve immediately. Mixed Italian herbs can be added in place of oregano. Increase or decrease the quantity of chilli flakes you use, depending upon how spicy you want the spaghetti to be. Vary the quantity of garlic, olive oil and oregano you use, depending upon individual taste preferences. I used sun-dried tomato-infused olive oil to make this dish. You can use plain olive oil instead, too. Traditionally, aglio olio e peperoncino is made using just a few ingredients – spaghetti, olive oil, salt, chilli and garlic and, maybe, a few dried herbs. I added in the sun-dried tomatoes and olives for extra flavour – you can omit them if you like. You could add in grated cheese (preferably Parmesan) for added flavour. I didn’t use any. You like? I hope you will try out this spaghetti aglio olio e peperoncino aka burnt garlic spaghetti, and that you will love it as much as we do! A dry curry with fenugreek greens (methi) and chickpea flour (besan) is a traditional Gujarati preparation. You will surely find this dish on the dining table of a Gujarati household, especially during the winters. The chickpea flour and the sugar added to the curry even out the bitterness of the fenugreek greens, making the taste absolutely fantabulous. It is a great, great way to incorporate the greens in your diet, I think. Amma learnt how to make this curry from one of our Gujarati neighbours, back when we were staying in Ahmedabad. And then she went on to teach me how to make it. This curry has always been a hot favourite with me, and it still is. Place the fenugreek leaves in a colander. Wash them thoroughly under running water, ensuring that no dirt remains. Keep aside, and let all the excess water drain out. Meanwhile, dry roast the chickpea flour in a pan on low-medium flame, till it turns slightly brown and begins to emit a nice fragrance. Stir constantly. Take care to ensure that it doesn’t burn. Transfer onto a plate. Keep aside. Squeeze out any excess water from the fenugreek leaves. Chop finely. Keep aside. Heat the oil in a pan. Add the mustard seeds, and allow to splutter. Add in the asafoetida, and let it stay in for a couple of seconds. Now, add in the chopped fenugreek leaves to the pan. Turn flame to low-medium, and cook till the leaves are well wilted. This should take 3-4 minutes. To the pan, add salt and red chilli powder to taste, sugar, turmeric powder and roasted chickpea flour. Mix well. Cook on low-medium flame for about 2 minutes more, ensuring everything is well incorporated together. At this stage, if the curry feels too dry, you could lightly sprinkle some water or add a spoonful of oil to the pan. Done! Serve hot or after bringing to room temperature, with rotis and daal or kadhi. This is a dry curry and, hence, best served with a liquid-y accompaniment. 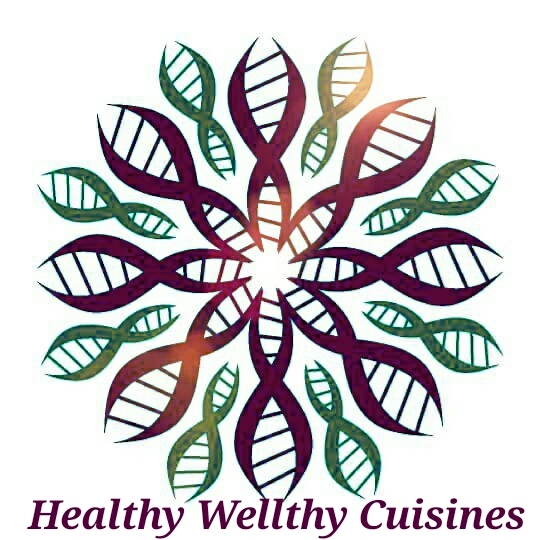 Initially, you might feel that the quantity of fenugreek leaves you are using is way too much. When you start cooking them, though, they really wilt down to a very little quantity. While this is a very simple curry that needs very few ingredients, getting it right might need a bit of practice. I would strongly suggest you keep at it, though, for the taste is totally worth the effort you might be putting in. Using slightly more oil will give you a curry that isn’t very dry. I try to limit it to about 4 tablespoons, though, usually. This curry tastes best with sugar. Trying to substitute sugar with jaggery alters the taste of this curry, so that isn’t something that I would recommend. A dash of coriander and cumin powder OR garam masala can be added to the curry, too, but I like keeping it simple. This recipe is for the Foodie Monday Blog Hop. The theme this week is ‘cooking with greens’. I am a big, big fan of double beans in the dried form. Recently, I spotted fresh double beans (also called sem or lima beans) at the Jayanagar market, and couldn’t resist picking up some. I used them to make this beautiful pressure-cooker curry to go with rotis, for lunch today. The curry tastes absolutely delectable, if I may say so myself. I made it in a pressure cooker, something I often do with curries, a super-duper easy way to cook stuff. And.. the best part? The curry used just 1 teaspoon of oil in all its entirety! Let’s check out the recipe now, shall we? Wash the double beans thoroughly under running water. Place in a colander, and let all the excess water drain out. Chop the tomatoes into large pieces. Puree in a mixer. Keep aside. Finely chop the onions and coriander leaves. Keep aside. Heat the oil in a 3-litre pressure cooker bottom. Add in the mustard seeds, and let them sputter. Add the asafoetida and cumin seeds, and let them stay in for a couple of seconds. Add the chopped onions. Saute on low flame till they begin to turn brownish. Now, add the tomato puree, along with salt and red chilli powder to taste, as well as the sugar and turmeric powder. Mix well. Cook on low-medium flame for a minute or so. Add in the washed and drained double beans, along with the chana masala. Add about 1 cup water. Mix well. Close the pressure cooker and put the whistle on. Turn the flame to high. Let the curry cook for 4-5 minutes on high flame. Let the pressure come down naturally. Once all the pressure has come down, add in the finely chopped fresh coriander. Mix well. Garam masala or pavbhaji masala can be used in place of chana masala. Omit the sugar if you don’t like a hint of sweetness in your curry. You could add a dash of lemon juice to the curry after preparation, too. After preparation, if you think the curry is too thick, you could add some water, adjust spices and salt, and let it simmer on low-medium flame for a few minutes. A tablespoon of thick curd added to the curry (while adding the tomato puree) will improve the taste drastically. You could add a dollop of fresh cream, instead, as well. If you are afraid of burning, you could add slightly more water to the curry. Post cooking, you could simmer the curry on low-medium flame to make it thicker. If fresh double beans aren’t available where you stay, you can use dried ones to make a similar curry. Just soak the dried double beans in water overnight, discard the water in the morning, pressure cook them for 4 whistles in just enough water to soak them, and then proceed with the above recipe. If you want, ginger-garlic paste can be added in the curry, while adding the onions. You could even add in a 1-inch piece of cinnamon, a few cloves, cardamom and a couple of bay leaves, to make the curry more flavourful. If using, add these in along with the chopped onions. This post is for the Foodie Monday Blog Hop. The theme for this week is ‘Recipes with just 1 teaspoon oil’. Considering our love for Pan-Asian food, the husband and I had been eagerly waiting for a chance to visit Misu on St. Marks Road. The place had been on my must-check-out list ever since it opened up, recently. Rave reviews of the food here by several food bloggers ignited the fire further. We decided to descend upon Misu one weekend, for lunch, and were not one bit disappointed. We absolutely loved the food we had here! The vibe at Misu is nice, warm and welcoming. The eatery is medium-sized, neither too cavernous nor too tiny. The decor is simple and elegant. The mirrors on the ceiling, the long windows letting in the sunlight, a mural of a lady holding a fan across her face – everything adds to the charm of the place. We found the seating here to be comfortable. Misu serves Pan-Asian food, both vegetarian and non-vegetarian. There are plenty of options on the menu for both varieties of patrons. Most reviews of Misu mention their Rainbow Dumplings – colourful, pretty, bright, happy little things. I love the look of them, and so the vegetarian version of these dumplings were the first thing we ordered here. The dumplings came to our table looking pretty as ever, but sadly, they weren’t really our cup of tea. We weren’t bowled over by them. The bok choy stuffing within was something that failed to excite our tastebuds. The Fried Turnip Cake that we ordered next was brilliant, and we absolutely loved it. Never would I have thought that something with turnip in it could be as beautiful in taste as this savoury cake was. The balance of sweet and sour and spicy was just perfect in this dish. To go with the starters, we ordered a Sweet Lemonade (without soda) and a Virgin Mojito. We loved the Virgin Mojito, and felt it was very well done. The Sweet Lemonade was good too – not extraordinary, but not bad either. The Vegetarian Tom Yum Soup that we ordered next was absolutely lovely. It was just perfect, neither too watery, nor too thick, very different from the watered-down stuff you get in the name of Tom Yum Soup in most Asian eateries. Next up, we ordered some Khao Suey, which was, again, just perfect. The coconut milk broth was extremely flavourful, and we loved it to bits. Most Asian restaurants bring you the Khao Suey in a bowl, all ready. Quite unlike that, at Misu, the various components of the Khao Suey are brought to your table – the broth, the peanuts, the veggies and the noodles – and you get to mix them up just the way you would like. That is something that initially overwhelmed us, but an experience that we came to love eventually. We were presented with some Chocolate-Chilli Truffles post this, something that isn’t on their regular menu, but only offered to diners on a complimentary basis. They were brilliant too, so very well done. We loved everything about these truffles – the Bournvita-and-sugar-coated exterior, the gooey chocolate interior, the hint of bitterness, the beautiful fragrance of good-quality chocolate, the chilli that kicked in after the sweet taste of the chocolate had almost left our tastebuds! Yum! We also ordered Mango With Sticky Rice, which was lovely too. It was simple and elegant, mild but delish, the way it is supposed to be. Service was quite fast, we felt. We reached Misu just a bit before lunch hours closed, and everything we ordered arrived at our table super fast. The staff was courteous, polite and helpful. The prices here are on the higher side. We paid about INR 2500 for this meal – high, but we are definitely not complaining about the quality or taste of the food here or the experience we had. We’d definitely love to come back here to sample more of the Pan-Asian delicacies on their menu. Have you been to Misu yet? If so, how was your experience? What are your favourites on their menu?